HIST 499 is the capstone course in the history major. Students usually take 499 in the final year of their studies, though juniors sometimes take it, too. In 499, students undertake a research project of their own design and, with close and attentive faculty mentoring, work toward writing a substantial paper over the course of a semester. 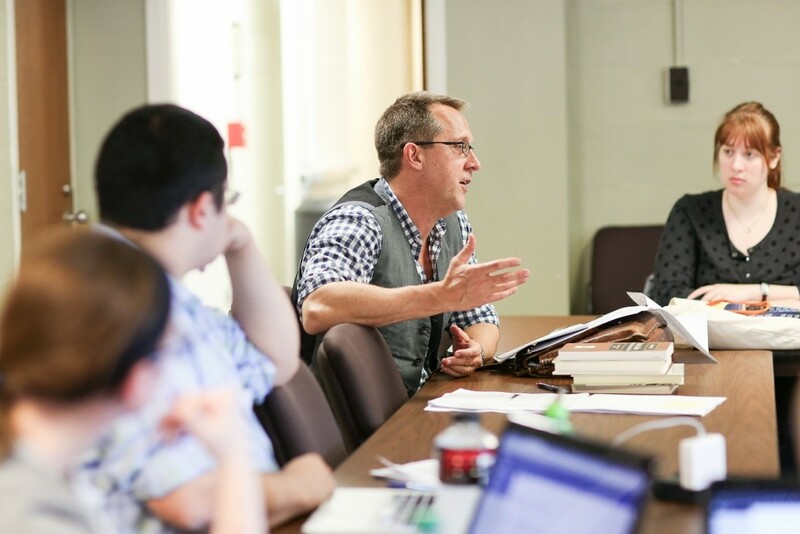 Most history faculty teach 499, and they work in a broad variety of fields. These faculty have widely varying research and teaching interests and they approach the study of the past differently. The faculty who teach 499 often take their own, specific research interests and current writing projects as the themes of their 499 courses. This means that by taking a 499, students are participating in the cutting-edge research projects of our faculty. This seminar focuses on the Algerian Revolution of 1954-1962. The course examines French colonial rule in Algeria and the rise of the Front for National Liberation (FLN). Other themes include the use of torture in the conflict, the role of public opinion and journalism, the independence of Algeria, and the mass departure of European settlers in 1962. In addition to learning about scholarly debates and methodology, students explore the role of memory and politics in shaping our understanding of this period of history. This course examines the religious beliefs, practices and institutions of the Christian peoples of Western Europe in the complex and fascinating Later Middle Ages (roughly 1300-1500). This was a period marked by contradictions: crises such as famine, plague, social revolutionary fervor, and schism and corruption in the Church existed side-by-side with the extraordinary cultural flourish of the Renaissance, and with religious movements that provided people an abundance of opportunities to use and shape their religious culture in meaningful ways, with or without the sanction of the institutional Church. This seminar explores various manifestations of and encounters with the supernatural across time and around the globe, and takes up a series of interesting questions. For example, how have supernatural phenomena been interpreted and understood in various historical cultures? Through what practices have people drawn on—or sought to avoid or ameliorate—the power of the supernatural? How have people distinguished religion from magic, and knowledge from superstition, in different historical cultures? Does the term supernatural even make sense—and if so, what does it mean? Is it meaningful only in “Western” societies or does it have broader applications? How can folklore, the human imagination, and fantasy, which have often been excluded as legitimate sources for knowing about past societies, actually help us understand a great deal about those societies? What have been the effects of supernatural experiences and beliefs on history in a broad sense? This course explores core debates in American history before, during, and after the Civil War. Topics include the slavery debates, the political crisis of the Union, the meaning of the war, civil and voting rights, and the making of the modern American state. This course focuses on the region we call Appalachia from the Revolutionary era through the Cold war period. What we now call Appalachia began as an upland intersection between Amerindian and European societies. It was later a subregion that complicated the nineteenth century’s sectional duality of ‘North’ and ‘South’ and, eventually, became a puzzling zone of poverty that continues to defy the myth of American exceptionalism. In the course, special emphasis is placed on issues of political economy, regional identity and the complex intersections of class and race. Self-improvement is not a recent invention. How to win friends and influence people, The power of positive thinking, and even Become a Better You: 7 Keys to Improving Your Life Every Day have ancient Mediterranean antecedents. However, by contrast with most contemporary “self-help” programs, ancient self-transformation or self-fashioning often aimed at radical and total change—a complete re-orientation of one’s entire being. Thoughtful men and women in the ancient Mediterranean world attempted to change or to perfect themselves according to a wide variety of principles (philosophical, religious, ethical, political) and for a wide variety of reasons (to live the best life, to achieve public success, to earn immortality, to impress their peers). This seminar samples ancient “self-help” literature, ranging from philosophical to rhetorical and religious texts, in combination with important and challenging modern interpretative studies in order to understand how ancient men and women tried to transform themselves and their lives. Biography is perhaps the most popular form of history for most readers interested in the past. But as a genre, biography has often been dismissed as insufficiently intellectual. Still, historians sometimes undertake to interpret lives that are of large importance in the culture. Biographies about controversial characters sometimes shape intellectual currents. This course is designed to introduce senior history majors to the process of research and writing in history by examining the writing of biography. What does a person need in order to live a good life? In different times and places, people have come up with a wide variety of answers to this question. In this course, we will explore together the different ways that Europeans and Americans have searched for health and happiness in the centuries since 1700, examining along the way questions related to the history of medicine, the history of psychology, the history of education, and the history of everyday life. This course explores three topics in particular that prompted Europeans to debate the proper relationship between science and religion from the mid-eighteenth through the mid-twentieth century: evolutionary theory, the mind sciences, and biblical history. The creation of the first empire in China took place in multiple fields of activity, no one of which had sole responsibility for the outcome. Students in this class will learn about the political thought, religious observances, ritual forms, legal systems, social practices, and significant events in the period when the Chinese empire was coming into being for the first time, roughly from the late third century BCE into the early first century CE.